Today I tried to Telnet into a Cisco switch at work today not remembering that Windows 7 doesn’t have Telnet enabled by default, neither does Vista for that matter. I guess in an attempt to make Windows a little more secure as Telnet by it’s self is not a very secure form of communicating. 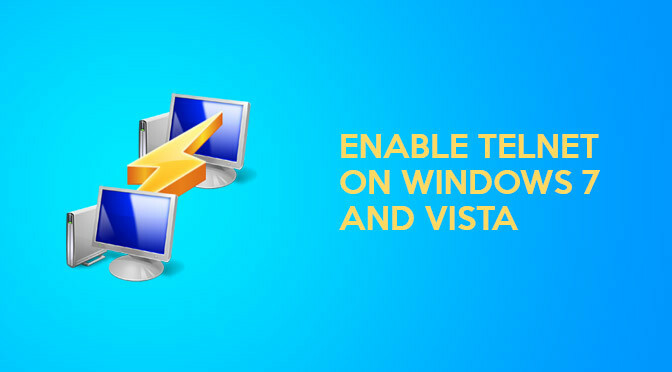 Regardless of security there are times when Telnet is going to come in handy and there is a very quick and easy way to re-enable it on Windows Vista and Windows 7. Both should use the same method. In the left hand side column select ‘Turn Windows Features on or off’. Scroll down and select ‘Telnet Client’. Windows will now install the Telnet client and you will be able to run it from the command prompt (cmd) using the ‘telnet’ command. In most cases I use a much better telnet alternative called Tera Term which also supports SSH (a much more secure protocol). Check it out, it’s free! download it on XP,after putty -ssh 10.1.1.201, I always reivcee same error message: network confused on VMware host ESXi 5.0 and try -telnet 10.1.1.102, it is win2008 Server R2, get same error message, neither to XP itself.Why?could you help me?